Support RootsWorld with a small contribution? There will not be a month long festival for a while. But we will cover accordion music all year round. The Danish word svøbsk refers to a type of dance in which participants twirl themselves into a state of dizziness: an apt moniker for fiddler Jørgen Dickmeiss and accordionist Maren Hallberg, who indeed create uplifting music. In 2009, they added pianist Theis Langlands and percussionist Simon Busk to their roster. Yet despite the connotations of its title (Bjergtaget means "spellbound"), this first album by the Svøbsk Kvartet is as lucid as they come. Tyran Grillo joins the dancing. Shtreiml's blend of Jewish roots and Turkish blues music - led by harmonica and keyboard player Jason Rosenblatt - bridges the gap between traditional and modern instrumental music, mixing fragments of old melodies with fresh ideas. Rosenblatt has an incredible range which compliments Ismail Fencioglu's oud playing and Rachel Lemisch's trombone runs. 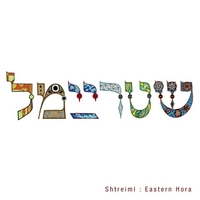 Together with Thierry Arsenault on drums and Joel Kerr on bass, Shtreiml writes new Jewish music with a progressive, eastern twist. A potent mixture of rock, funk and jazz fuel their calculated yet unencumbered compositions. Alex Brown finds the band in terrific form on Eastern Hora.